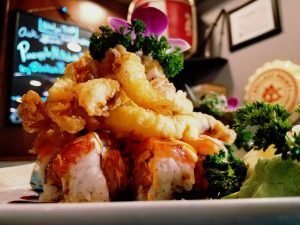 Looking for fresh seafood and sushi? Us too! 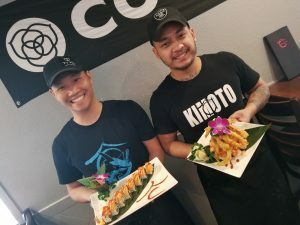 We found the most delightful dishes at our local “izakaya” (Japanese for “stay in sake shop” or what we call a Japanese Pub), Kimoto Sake & Sushi in Modesto. Owner Brandon Dodge and his great team of chefs met with us to take us on a taste-bud journey to Japan! Chef Dara Ny likes to both make *and* eat the Soho Roll. 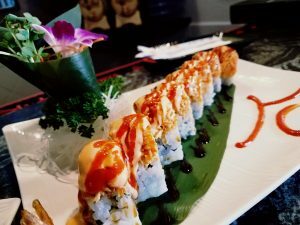 “It very fresh and authentic, it is a full sushi experience in one roll.” He spent a lot of time in the kitchen growing up, learning tricks and tips from his mother. “I cooked all the time! I love sushi!” I don’t know about you, but I like knowing the chefs making my food loving making and eating it, too! 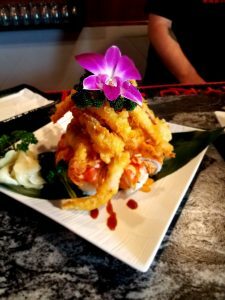 We ordered a best seller first, the Hotel California, featuring deep fried shrimp, crab, avocado and cream cheese drizzled with a spicy mayo. Then we ordered a fun one to make: The Fuji Mountain! It has shrimp, salmon and crab with cream cheese and it’s topped with a mountain of calamari! We loved the Fuji Mountain, but the Walkey roll was our favorite by far! Named after a frequent patron, it’s a spicy shrimp delight with jalapenos in every bite. They order small fresh raw orders from our very own California shores three times a week . Fridays are known as “Specialty Friday”. It’s the best day to stop in if you want something rare and special. If you’ve never tried Wagyu (beef), Toro (blue fin belly), Aji (makerel), or Anago (salt water eel), then that’s the day to try them. They order small quantities so when they’re out, they’re out! Don’t take your Sunday brunch chance to try these gems, get in on Friday night instead. 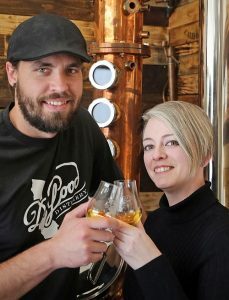 Brandon isn’t just the owner, he is also head bartender and paired a great cocktail with our rolls, the Manhattan East. Whiskey, sake, and ginger liqueur were stirred together, then garnished with an orange peel . It was the perfect way to follow up such a wonderful dinner. If you prefer to eat your calories rather than drinking them, you can’t go wrong with an order of fried oreos for dessert. 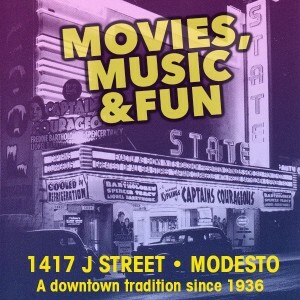 Why a Japanese pub in Modesto? Because it’s different! 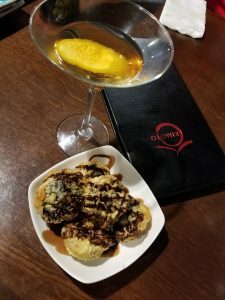 Who doesn’t love drinks, sushi and hanging out with people you enjoy? With elements of Japanese culture, large TVs for watching sports, a relaxing atmosphere and mouth-watering food you are sure to have a great izakaya experience right here in your own city. Some come in to eat creative and delicious plates of food, ranging from small bites like pineapple salmon to the large plates like the Fuji Mountain, while some of us come for the drinks. Before ending our little excursion into another culture, we asked Brandon if he prefers the Beatles or the Stones. “Stones!” Sorry Beatles fans, maybe next time! Also, you can order on the doordash app and they will deliver right to your door! 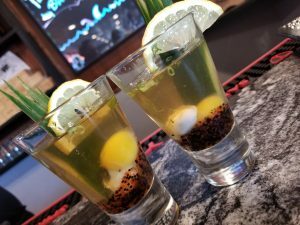 If you are as brave as we are, try an oyster shot! Super interesting texture and taste! 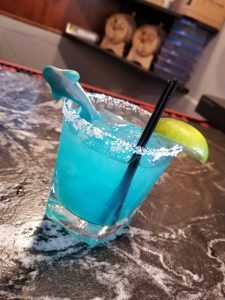 Also, stop in during a Sharks game to order a Sharkarita! Brandilyn preferred this sweet sugared rim delight to the oyster shot! Follow them on Facebook for special event info like UFC, Sake Events, and Tap Takeovers!